The tiniest dwarf galaxies contain only few thousands of stars and are so faint that they cannot be observed elsewhere, farther than the halo of the Milky Way. By analysing their dynamical properties, a French-Chinese team of astronomers from the Paris Observatory - PSL, the National Astronomical Observatory of Chinese Academy of Sciences (NAOC), and the CNRS, has discovered an exceptionally strong relation between the assumed dark matter content in most dwarf galaxies, and the gravitational force due to the Milky Way. The relationship is so strong that the probability it is only due to a coincidental chance is smaller than one part over ten billion. This implies that the Milky Way gravitation does control the stellar motions in these dwarf galaxies, and conversely, that the in-situ dark matter does not. The team of astronomers has also shown that the correlation does not depend on the stellar mass. How can one explain such a result? This study may affect most of our knowledge about the dark matter content in dwarf galaxies, since it could be extended to those in the neighbourhood of the Andromeda galaxy. "These results do not prove the absence of dark matter in dwarf galaxies, although there is no reason to further suppose its presence in absence of any proof", specifies Fran？ois Hammer, astronomer of the Paris Observatory - PSL, first author of the study. The team pursues studies to verify many predictions in particular in using the last results of the Gaia satellite. Fig.1: The ordinate shows the supposed ratio of dark matter to stellar mass, which correlate very precisely with the ratio of the Milky Way gravitational acceleration to that caused by the stellar mass. Each of the 17 dwarf galaxies is represented by one point in this Figure. 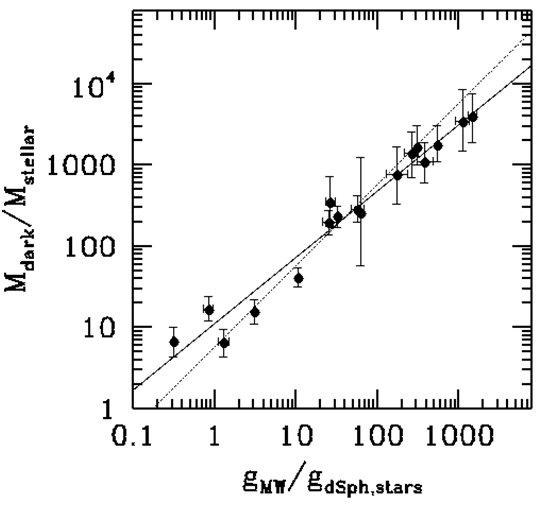 The full line shows the exceptionally strong correlation for dark matter to stellar mass ratios from 10 to 4000. The dotted line indicates the prediction based on the first passage scenario. 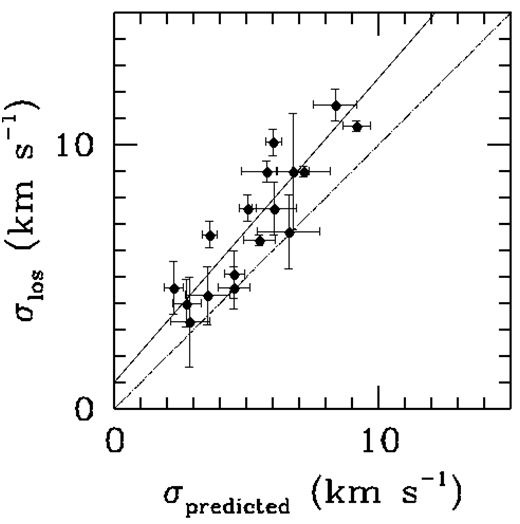 Fig.2: Stellar motions in dwarf galaxies are currently measured by the velocity dispersion of stars along the line of sight (slos). The abscissa provides the prediction from the first passage scenario (spredicted) that is very close to the measurements (slos, ordinate), which were done using high-resolution spectrographs. Lines have the same meaning as in the former Figure. Credit: Observatoire de Paris - PSL/ Hammer et al. 2018.